"...Why did you do this to me?" "Because I'm your Master and Creator and I wanted to give you a fancy dress, that's why!" "You know I hate you right?" "Oh come on, try to have fun for once! Look, Alinna even made sure to include Strudel in the buffet! You should thank her!" "*groan* Forget it. And for the love of God, what the hell are you wearing??" "I'm a scary ghost!" "....Yeah, sure you are." 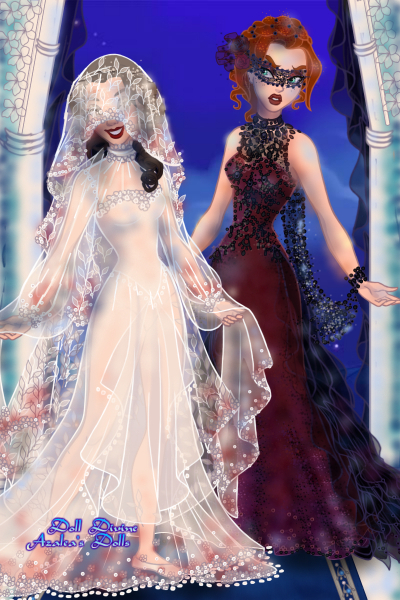 Me and Anna ( from the #TwilightRealm )are attending @LadyLeaf 's All Hallow's Eve Midnight Masquerade! We will be waiting for you at the buffet table, probably. I have no words more... It's gorgeous! "Welcome you White Queen from Dolldivine, your costume certainly is an ethereal one, and I complement you on accuracy! I adore the fabric, the beading, and the leaf patterns on your veil. The redness is a neat touch as well! Madame la'Chandour is most thrilled by your gown! In fact she's dying for a little chat. And Mr. Lysandris, would you kindly show the two ladies to the buffet table?" (under her breath) "Make sure to refill the chocolates and strudels!" "Why if it isn't the Flaming Rose of Rosenschwert! What a delightful surprise! The dress suits you well, even better mind I say, as your hunter garb does. You must give me the name of your tailor! His/her craftsmanship on the lace patterns are exquisite! And maroon suits you! A proposal, say we wear our best to our next duel? But let us not speak of that yet, tonight we enjoy the party." Thank you @2BlueWizards!! !I can't wait to see your OCs joining us!